I've been Adopted! 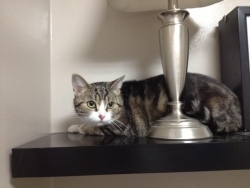 - Alyrea has found her new home! We'd like to introduce Alyrea. She’s from the same Good Samaritan who brought Chloe to us. She was a street cat who they brought in out of the cold last fall and have been trying to find a new home for her ever since. She’s about 3 years old and we’ve already gotten her spayed. Rebecca had her purring and doing happy toes within minutes of her arriving she’s such a happy girl. 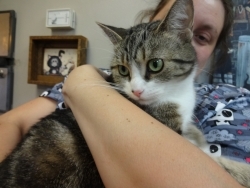 She is currently available for adoption at The Cat Clinic. Please share her information so hopefully she can find a forever home quickly. Alyrea went to her new home this week and she and her new buddy are getting along fabulously! Congrads Alyrea!